Public Health England have announced that 90% of all extractions of young children, aged 0-5, teeth are due to preventable decay. In 2017-8 this amounted to 12,783 extractions for children under 5 because of avoidable tooth decay! Sadly not all is equal in statistics, it is areas of poverty that have the most instances of children with tooth decay. Take your child to the dentist. It’s free! NHS dentists will provide check ups and treatment for children under the age of 18 totally free of charge. You should take your child to the dentist at least before they turn 1. The good news for mothers is that if your child is under 1 years old then you also don’t have to pay for dental treatment! Tooth brushing. The important thing is to get your child in the habit of brushing their teeth as part of a daily routing and by showing a good example by you brushing twice a day as well. Trying to brush a toddlers teeth isn’t always easy, so try and get them excited to do it, or make a game of it. The NHS recommends you sit your child on your knee with their head at your chest and brush their teeth in that position. Sugar. Sugar can be terrible for tooth decay which leads to children having their teeth removed. Sweet drinks, lollipops, fruit squashes and fizzy drinks can all be very harmful to children’s teeth, especially when they are drunk out of bottles (as the drink spends longer in contact with the teeth). Try to cut it down by diluting squashes heavily or drinking milk. Children who have tooth decay very early in their lives and have teeth extracted are much more likely to develop problems in their adult teeth. 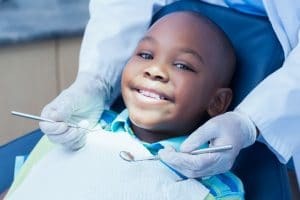 Setting young children up with good dental and diet choices that are good for their teeth will not just help them now, but also in the future!